Spring has sprung at the Abbey! 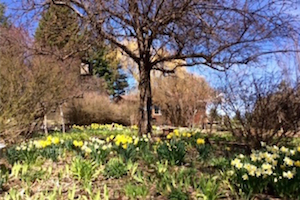 Aside from a surprise snow shower in the middle of April, the last of the snow banks has melted away to reveal fresh grass and sunny daffodils. We’ve eased out of retreat gently and rejoice in opening our doors again to friends old and new. Come spend some time with us soon! See photos of the start of our 2018 season here. Abbey residents concluded our annual Winter Retreat, during which we meditated on Amitabha Buddha, by welcoming guests to the first Sharing the Dharma Day of the year. After a guided meditation and Dharma talk based on An Open-Hearted Life by Ven. Chodron and Dr. Russell Kolts, the nearly 70 people in attendance had a delicious potluck lunch. Watch Ven. Chodron’s talk on “Courageous Compassion” here. Usually, Sharing the Dharma Day afternoons include a discussion group and tour of the Abbey. Instead, to celebrate the conclusion of retreat, we did the Lama Tsongkhapa Guru Yoga and tsog puja. Here we expressed our gratitude to the Buddhas and bodhisattvas for having had the opportunity to do retreat and to thank all our supporters for their help. Without the kindness of our local, national, and international friends, the retreat could not have occurred. Together, we dedicated the merit accumulated from doing retreat and serving the retreat. We also rejoiced and dedicated the merit of the 170 people who did the Retreat from Afar. This was a happy day indeed. Ven. Chodron’s spring journeys started out in Boston with talks at Harvard Divinity School and Kurukulla Center. Watch the archived livestream from Kurukulla Center on “Living an Open-Hearted Life” here. Visiting Wisdom Publications, she saw volume two of “The Library of Wisdom and Compassion” entitled The Foundation of Buddhist Practice , which will be released May 15. It’s a beautiful and informative book by H.H. the Dalai Lama that she co-authored. Learn more about the book here. 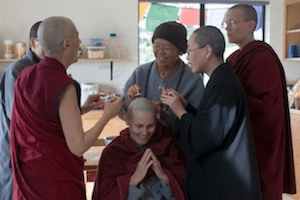 She then flew to the Netherlands to teach at Jewel Heart Nijmegen, a lovely and harmonious Dharma center where about 150 people attended the public talk and 90 attended the weekend retreat. The teachings centered on the fourth chapter of Nagarjuna’s Precious Garland about how a government informed by the Dharma should operate. Watch the public talk here and the retreat teachings here. Karen, a Dharma student from Belgium, met Ven. Chodron in the Netherlands and traveled with her to the other European centers. The next stop was Aarhus, Denmark, where they spent a day at an intentional community and met with its spiritual teacher. Ven. Chodron then gave two talks at Osal Ling Tibetan Buddhist Center in Aarhus itself, to a lively and interested group. Watch the talk about mind training here, and the talk about consumerism and the environment here. From there they traveled to Copenhagen. Denmark is filled with parks and bicycles; it’s nice to see families outdoors enjoying themselves in the spring sunshine. Ven. 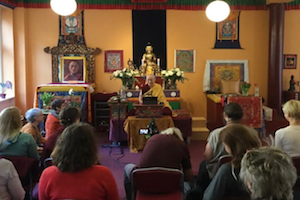 Chodron taught at Phendeling Center, where the talks centered on chapter three of Precious Garland, about how to fulfill the collections of wisdom and merit that lead to the Buddha’s truth body and form bodies. Ven. Thubten Jampa attended the teachings in Copenhagen and traveled with Ven. Chodron and Karen to Hamburg, where Ven. 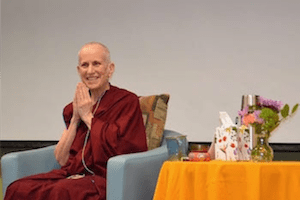 Chodron gave a public talk and led a three-day retreat on working in the world with wisdom and compassion, based on Approaching the Buddhist Path. Next week, they continue to Russia for public talks and a retreat. Everywhere they have been warmly welcomed by enthusiastic and hospitable people. Enjoy photos of the trip so far here. 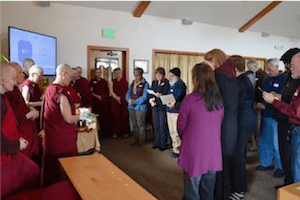 The Abbey community observed our fifth monastic retreat or varsa, a practice begun in the Buddha’s time to support harmony in the monastic community and the flourishing of the Dharma. 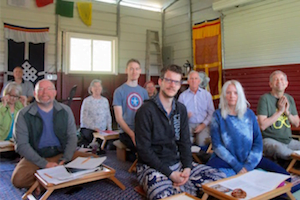 After staying in one place to practice intensively for three months, we conclude the retreat by inviting each other to give feedback about our Dharma practice in a ceremony called the pravarana, or invitation. Photos of the pravarana are here. 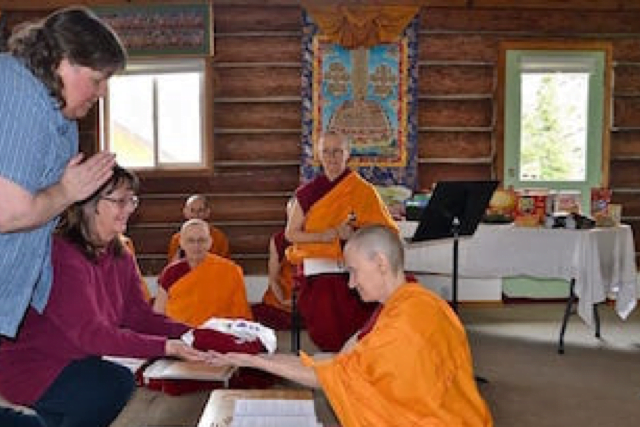 After the monastic retreat, we also invite the lay community to share in our joy and merit through the kathina ceremony, a tradition that celebrates the interdependent relationship between the sangha and laity. The day began with a procession to the Meditation Hall, where Ven. Samten gave a Dharma talk on these three traditional Buddhist practices, which you can watch here. 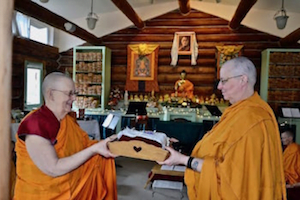 On behalf of the sangha, she received a “robe of merit,” which symbolizes all the requisites for life. The robe is then given to a senior monastic who needs a new robe. Long-time Abbey supporters Donna and Danna, representing all our lay donors, offered the robe this year, and Ven. Jigme was the appointed recipient. The intimate gathering of dedicated local Abbey friends ended with a potluck lunch and much rejoicing all around in the support for the continued existence and growth of the Abbey. See photos of kathina day here. After emerging from retreat, Abbey residents engaged in a four-day workshop on Nonviolent Communication (NVC) with facilitator LaShelle Lowe-Chardé. Based in Portland, LaShelle has facilitated online NVC classes for our community since 2013. This was her second in-person workshop at the Abbey. The first day was dedicated to community-building exercises, and almost everyone joined in. Nine members did the full workshop, which focused on anchoring the body and mind, touching in with underlying feelings and needs, and making doable requests of self and others. The training opened our hearts and gave us more tools for compassionate communication. We are grateful for LaShelle’s generosity and skill. Watch LaShelle’s talk on the relationship between NVC and Buddhism, and Ven. Jigme’s reflection on the workshop. Ven. Chodron spoke on “Connected in a Divided World” at North Idaho College to an audience of 150 people. She had just finished reading The Second Coming of the KKK by Linda Gordon and used the resurgence of the KKK in America in the 1920s as a way to illustrate how common values and common enemies connect a group of people. She then appealed to more inclusive values and traits in order to enlarge the group of people we connect with. She also deconstructed the notion of the rigid classification of friends, enemies, and strangers. All living beings want to be happy and not suffer. No matter how divisive or ignorant actions may be, everything people do is an attempt to be happy. If we can tune in to these commonalities, we can forgive others, have compassion for them, and connect with everyone on a deeper level, knowing that everyone has the potential to become a Buddha. Watch the talk here. The following day, Ven. Samten and Ven. 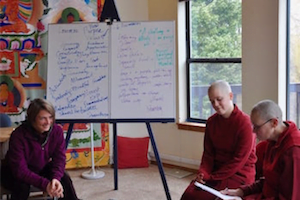 Lamsel visited Dr. Laura Templeman’s World Religions Class at North Idaho College to share their experience of the Buddha’s teachings and life as Buddhist nuns. The students engaged them in a lively discussion, posing questions about their decision to ordain and what benefits they had seen in their own lives from practicing the Buddha’s teachings. Our nuns have also resumed Monday night meditation classes at the Spokane Unitarian Universalist Church for the 10th year running. These classes are regularly attended by 40 to 60 participants, who share from the heart about their personal practice. We appreciate the committed core students who organize the teachings and led the Monday night classes while we were in Winter Retreat, focusing on The Book of Joy by H. H. the Dalai Lama and Desmond Tutu. The group now returns to reading Working with Anger by Ven. Chodron, with meditation and discussion facilitated by Ven. Semkye and Ven. Jigme. Learn more about the classes here. Ven. Chonyi traveled to Columbia, South Carolina for nine days of talks and teachings with the South Carolina Dharma Group. It was her second visit to their center. Topics for all of the events came under the umbrella heading, “Opposite of Anger,” which people seemed eager to explore. In several days of discussions at the Dharma center, the group focused on “Cultivating Kindness in Contentious Times,” especially examining anger or despair over current events. Recognizing and acknowledging the kindness of others is a critical step in developing the antidotes to anger—fortitude, love, and compassion. There were two public talks, including one at the Atlantic Institute, a Turkish Muslim group that promotes interfaith and cross-cultural dialogue. 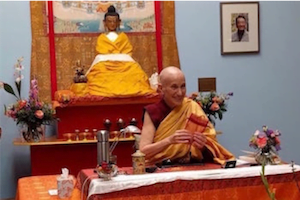 The visit culminated with a residential retreat on Chenrezig, Buddha of Compassion, and the “Eight Verses of Thought Transformation,” which members of the Charleston Tibetan Society also attended. This South Carolina group has been practicing together for nearly 20 years, and Ven. Chonyi was happy to share the Dharma with both new and long-term Dharma students. In addition, several Abbey friends from nearby cities were able to attend and join in. The combination of sincere Dharma practice and Southern hospitality made for a warm experience of deepening love and compassion on the path to transforming anger. On April 15, Ven. Jigme traveled to Connell, WA to participate in the annual Buddha Day at Coyote Ridge Correctional Facility. Ven. Jigme was moved by the sincerity and the kindness of the 30 inmates who participated, and also lay volunteers Tanya and Chris who have been instrumental in the group’s growth through their weekly visits. Tanya, who is also the Abbey’s webmaster, coordinated the inmates who knit to donate hats to middle schoolers. When she brought the hats to the Spokane County United Way, a community nonprofit organization, the woman who received them said, “This totally changes the way I think about prisoners.” We can see the powerful impact of the Dharma on everyone. In addition to giving a Dharma talk and leading a guided meditation, Ven. Jigme also gave refuge to three inmates who took all five precepts. There were sharings by inmates through poetry, song, and stories, and the group worked together to create a mandala. Ven. Jigme was honored to be part of this celebration with these strong Dharma practitioners. A group of Abbey residents joined in Newport’s recent Earth Day observance. The event featured two locally-filmed documentaries— Last Stand: The Vanishing Caribou Rainforest , and United by Water —and included speakers from the Kalispell Tribe and environmental activist groups. The movies were informative and heart-moving, showcasing the determination of many local people to protect and serve life—human, other sentient beings, and the environment. Ven. Lamsel talks about the event in this Bodhisattva’s Breakfast Corner talk. Care for the environment is an important Abbey value. 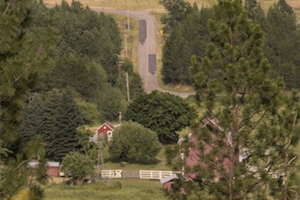 In addition to stewarding the Abbey’s forests and meadows, we have joined the Kalispell Tribe of Indians, Citizens Against the Newport Silicon Smelter, and others to oppose building a highly polluting and potentially hazardous smelter in our county. Read the Abbey’s letter against the project. Ven. Thubten Pende, the tenth bhiksuni at the Abbey, wrote about her experience receiving the bhiksuni ordination in Taiwan last December. Ven. Chonyi described a nun’s lifestyle, and Ven. Semkye wrote about how to become a monastic. Ven. Damcho reflects on what a monastery is. We continue the series of poems by Luis, a young man pondering what helps and impedes us human beings from caring about each other. Ven. Chonyi answers a question from a student about how to comfort a grieving non-Buddhist family after the death of a family member. Heather tells us about completing the preliminary practice (ngondro) of offering water bowls and the effect it had on her life. Ken shares his reflection on the search for security and predictability in cyclic existence. Read about the efforts of Reimagining Doeguling Tibetan Settlement, a Tibetan refugee community in South India, in the first issue of their annual magazine.